Like a garlic infused chicken breast in a hot oven, The Citizen is always infused with the spirit. Whether it’s because people go hungry and homeless on the streets of America or it’s his little black pussycat got out the house and his angry white neighbors complains to The Citizen’s friends at animal control, The Citizen has no bounds when it comes to jumping for joy or for Jesus. And Jesus never saw no sinners. Did he? Well, then, all you sinners, it’s time to listen to your faithful friend talk to Reid, a gospel singer and songwriter come latter day hipster. Reid fills The Citizen in on all the worldly things a man needs to know, like would Mariah Carey have a religious experience in bed with a holy ghost. Or would Mahalia Jackson tell you always have a friend in The Citizen. Once upon a time, people told you that the Bible said, “No, you can’t do that,” and, “No, you can’t do that,” and “No, you can’t do that.” Reid disagrees and tells The Citizen, “Yes, we can. 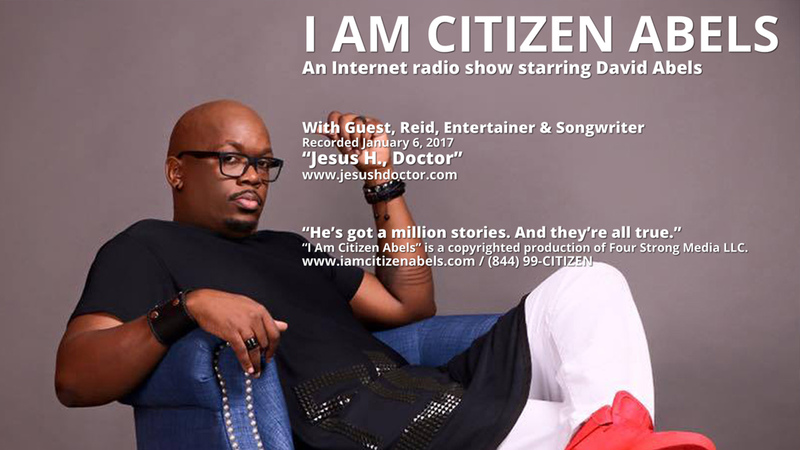 Yes, we can.” This episode of “I Am Citizen Abels” was recorded January 6, 2017. So, glory to God. The Citizen has been saved. Maybe war will stop too. Listen to Reid and The Citizen discuss all of this in, “Jesus H., Doctor."